So, you have never stayed at a B&B and your co-workers are telling you that they had such a wonderful time at a special B&B in Wisconsin last weekend. This sounds interesting but you have no idea of what to expect and you have a few questions. Well, everyone has questions and fortunately we have answers! Here are some of the questions that innkeepers hear frequently and their answers. If you have more questions, don’t be shy! Every innkeeper that I know wants to make sure that you pick the perfect B&B for your perfect visit each and every time that you visit us. So email us or pick up the phone and call. We would love to answer your questions. I’ve never stayed at a B&B. What is it like? Well, each B&B is a little different from every other B&B but what you will find the same at all is owner/innkeepers who want to make sure that your stay with them is comfortable, relaxing, and just what you expected it would be. The following questions may answer some of your more specific concerns. Do I need reservations? How far in advance do I need to make a reservation? While it may be possible to just walk in to some properties and get a room, it is a very good idea to make a reservation. Many properties have but a few guest rooms and innkeepers pride themselves on being fully prepared for your visit. If you are seeking lodging for a special event or your vacation, I would recommend making your reservation as soon as you have determined the dates. Please call the innkeeper as soon as you find out that you need to cancel. Each property has their own policies regarding cancellations and you should be aware of the policy when you make your reservation. Most properties have their policy stated in their brochures and on their websites. How should I act while I’m at a B&B? Relax, enjoy yourself. But remember that others may be trying to do the same thing so please abide by any rules that the innkeeper has established for guests. The rules are there for the safety and comfort of all. Am I actually staying in someone’s house? Can I come and go whenever I want or is there a curfew? The B&B may very well be the home of the innkeeper but WBBA standards, that your innkeepers must meet or surpass, assure your privacy, security, safety and comfort. If you are coming or going during normal quiet hours, please be mindful that there may be others sleeping and ask your innkeeper about access to locked entry doors during these times. I’m allergic to cats and scented things like potpourri really bother me. Should I just stay away from B&B’s? You and your allergies will be right at home at many WBBA member properties. Just use the search feature to find a property that is “Pet Free” and ask the innkeeper about scented products used at the Inn. You will find many properties where you can” breathe easy”. My medication needs refrigeration. Do B&B’s provide that? Let your innkeeper know of this need when you make your reservation. Some properties have refrigerators in the room. Some will find other ways to accommodate your need. Many properties are also happy to provide you with breakfast that will accommodate any food allergy or dietary restrictions that you may have. This varies from one Inn to another. It is best to inquire when you make your reservation especially if you have an early tee-time or a business meeting to attend. One thing is certain; you won’t want to be late for the most unique part of “Bed and Breakfast”. Can I bring my kids? They can just sleep on the floor. Every property has established policies about children on the property. Many welcome children at any time, some welcome children under certain circumstances and others simply are not suitable for children. Do check the search criteria list to find a property that matches your need. Our state licensing regulations require that each guest, including children, is provided with an approved bed. What is the difference between a B&B and a Country Inn? In times past, a B&B was a private home that provided a bed and a breakfast to travelers and a Country Inn or Inn was a more commercial enterprise that frequently provided other meals to overnight guests as well as to the local public. Today the terms are pretty much used interchangeably, so it is best to inquire about the extent of the food service at the property you are selecting, if this is an issue for you. Don’t laugh! We get this question all the time. No, it is not like summer camp. We provide you with plenty of towels, sheets, blankets, drinking water, even soap! And ever so much more, especially the personal attention of innkeepers who really do care about you as a guest and want to make sure that your visit meets your definition of “Bliss”. ringling June 23, 2015 In Uncategorized Comments Off on Welcome! 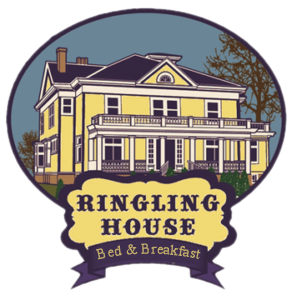 Welcome to the newly established Ringling House Bed & Breakfast! This unique Colonial Revival home is on the National Register of Historic Places. It was built in 1901 by Charles Ringling, one of the founders of the Ringling Brothers Circus, and was constructed with some of the finest materials and modern conveniences available. It has remained in the Ringling family for over 100 years, until now. You can be one of the first to experience the grandeur of this phenomenal home!